The Kindle e-Book reader will be unveiled Monday by Amazon.com. The device is said to be geared toward "road warrirors" and business travelers. 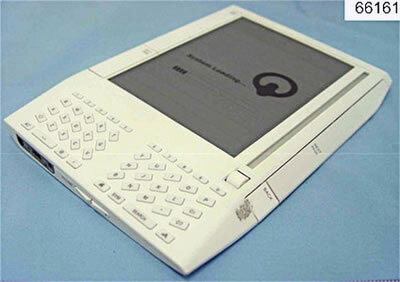 The e-book reader has been around in various forms (some of them pretty cool) for years. Take a look at the Toshiba SD-Book: An E-Book With Two Pages, the Sony LIBRIe E-Ink Electronic Book and the very stylish Sony Reader Electronic Paper Book. The Kindle e-book reader will have a headphone jack, for those who prefer to have books read to them. It will also have Wi-Fi connectivity (for direct download from Amazon). Amazon.com has also reportedly made deals with as many as 100 newspaper publishers; these publications will also be available for daily downloads. The final price is expected to be about $399. The Kindle reads only a few formats: Kindle (.awz), text (.txt), and non-DRM Mobi (.mobi, .prc). It will also read mp3 and Audible.com (.aa) sound files. You can pay Amazon a nominal fee to convert .doc, .pdf, and other format files to Kindle but it won't read them natively. This is nuts: no one wants to send important documents off to Amazon to be converted. MobiPocket DRM'd books are perhaps the most successful ebook format, and Amazon sells MobiPocket ebooks. I've not heard what will happen to those. Will Amazon convert them for Kindle buyers? Otherwise the early adopters who bought DRM'd MobiPocket Books are just out of luck. On the other hand, many ebooks including both free and sold Baen ebooks should be readable on the Kindle without conversion. Of course, as Robert Bruce Thompson points out, it won't be long before the user community hacks the conversion software, and converters will be offered free all over the net. That means that any pirated book can - and thus will - be converted into Kindle format and made available universally; and since Amazon is charging ten bucks for a new book encumbered with Digital Rights Management software, the incentive to use the pirate services rather than buy the book may well overcome the ethical inhibitions of many. The earliest reference to the e-book reader concept that I know about is the opton from Stanislaw Lem's Return from the Stars, a prescient 1961 novel. Via Amazon to debut Kindle e-book reader.